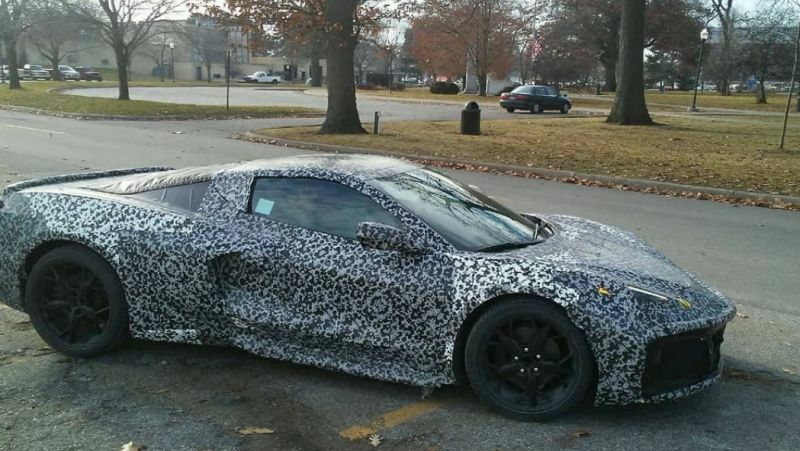 Last week, a couple mid-engine C8 Corvette test mules were spotted out in the wild up in Port Huron, Michigan. One of them was captured on video by a truck driver. Unfortunately, thanks to the exhaust on the red pick-up truck, we really couldn’t hear the test mule accelerate. Heavily camouflaged, this particular test mule looked different that than the others we saw testing over on the Nurburgring back in September. Thanks to Instagram poster @njhurren, we see that the front grill looks larger than the others we’ve seen which could be for additional cooling. We can also see what appears to be a strip of LED lighting near the headlights which is the first time we’re seeing this. The headlights should end up having a sharper, more angular appearance than previously thought. For the first time, we also get a look at the interior driver’s side door panel which appears to have a large rectangular hole cut out of it for the driver’s arm. This isn’t too unusual to see on mid-engine cars given their inherent shape and architecture, however, it’s highly unlikely that what we see here is the final production version. As we come around to the back, we can see additional camouflage which makes the rear-end look even taller than before. From the photos, it appears that the rear-end hasn’t really changed, so it could look different just from the additional cladding. However, looking at the engine cover, the black piece of camouflage is slightly transparent and underneath, you can make out a rectangular piece of black and white camouflage. We’re unsure what this could be as all of the other spy shots that we’ve seen of the rear hatch, appear to be completely transparent with a specially patented design to aid in engine cooling. Originally, we were thinking that the 2020 C8 Mid-Engine Corvette would be officially unveiled at the North American International Auto Show in Detroit this coming January, however, Chevrolet has already confirmed to automotive media that no new models are scheduled to be revealed during the event. Some folks believe that it could be unveiled at the New York International Auto Show in April, which would be fitting as the very first 1953 Corvette was unveiled to the public at the GM Motorama in New York. However, lately, we’ve been hearing rumors that it could be unveiled at its very own special unveiling event independent from any other car shows. How true this is, we cannot say, but we believe that could be a first in the Corvette’s history. Obviously, the most popular question among the public is, why isn’t being unveiled at the NAIAS? Based upon rumors, unfortunately, GM Engineers encountered some issues with the mid-engine Corvette’s electrical system not being up to par to handle the load from all of the onboard electronics. It’s generally believed that the mid-engine Corvette could come with a 48-volt electrical system which is what the Acura NSX and a lot of other hybrid sports cars use. This really isn’t too surprising to us, as we had originally reported back in June of 2017, that three or four models of the mid-engine Corvette are expected with a powertrain capable of putting out up to 1,500 hp. This powertrain would be a hybrid combination similar to that seen on Ferrari’s LaFerrari. It is expected that all will be revealed sometime in the Summer of 2019. Stay tuned!